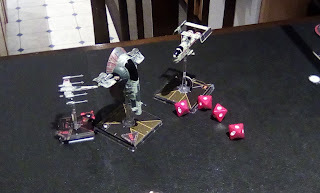 Why not start your second X-Wing blog post with a bit of classic Sun Tzu!! As mentioned previously I fly in a casual weekly get-to-gather. Most of us don't day dream about list building and don't rehearse flying our squadrons on the online simulators, and that is fine. Fly Casual right. But then, according to Sun Tzu, we should not be surprised if we succumb in every battle. Last weekend I flew my new favorite squad “Soontir Fel's Flying Circus” After last Monday I will have flown about 3 real games and 6 games on the fly casual simulator with it and I think I know it. Of course knowing a squad comes easier if you have flown lots of other similar squads before. Many years ago I read a blogger who said that his magic number was 6. After 6 times with a new squad he could “skate with his head up”. He wasn't worried about forgetting his rules or knowing his dials and more than that he had a plan!! 1 x Scimitar Sqn Bomber whit Barrage Rockets and Proton Bombs. The 6 rehearsal games were flown on Sandrem's Fly Casual simulator. If you don't know what it is google it, the AI does not follow all the rules of XWing, the computer sometimes gets to focus when you wouldn't and sometimes doesn't get stressed when you would. But it is all done to increase the difficulty and overall the simulator is great for learning your ships. 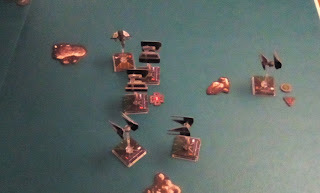 What I learned was that sometimes my interceptors won the game and sometimes my bombers did (seems obvious right). 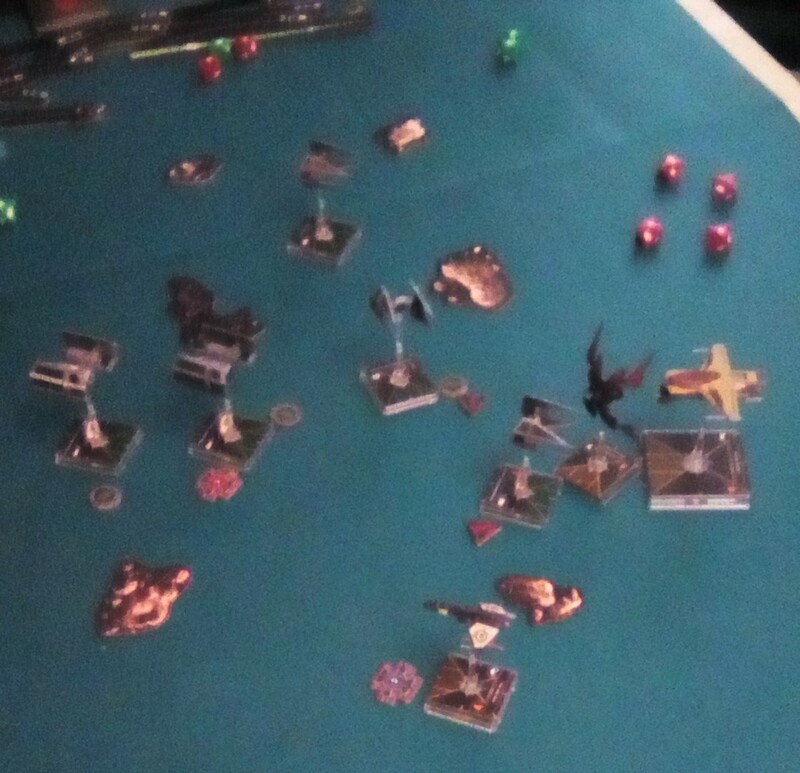 But looking more closely, when I flew my Alphas aggressively and they bumped enemy higher PS ships then in the engagement phase I would have green tokens and the enemy wouldn't. With the bombers, If I got my rockets off at long range and then if I got the bomb/K-Turn timing just right I could do massive damage with them as well. And Soontir, well when he dies it makes me sad so I would just try to keep him around looking menacing. My last two real games looked like this. First game was against a scum list with the Kimogila, star viper and Kihraxz. 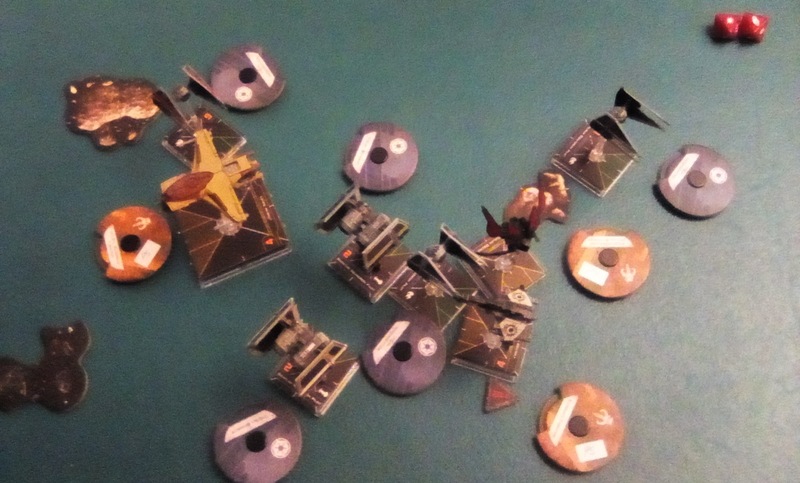 All his ships were PS 4-5, and his Kimogila could strip green tokens in his bulls-eye. The plan was simple, bump with the interceptors, hang back and blast whit the bombers and since Soontir went last he could just lurk, make conservative moves and use his boost barrel roll to get out of arc of an enemy that had already moved. The second game against Rebels (Luke, Wedge and a U Wing) went in a similar fashion. Shortly after this picture was taken the U-Wing and Luke (bottom right) were destroyed. So.... in both games the interceptors bumped and denied green tokens while the bombers did reliable damage with rockets from long range and bombs on the K-Turn. I am not saying I am the next Red Baron and the dice certainly had their moments, poor Luke poor poor Luke not as strong with the force as we all thought. But, In both games my opponent excepted a joust he could not win. I had 15 red dice to his 9 and my average agility was 3 and his was 2. I believe when you don't know your list you will joust with it by default. 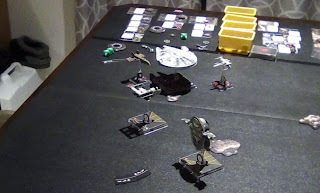 I also believe that X Wing always has its ebbs and flows of luck. The trick is to make the best move you can every time so the bad luck gets mitigated and the good luck gets emphasized. This is only possible when you know your list first and hopefully have enough experience to know your opponents as well. Hello it has been almost a decade since my last post but its like riding a bike right? The other day I was playing at my weekly casual gathering and during my last game I noticed something unusual. The five remaining ships all had a pilot skill of four. This is how it unfolded. 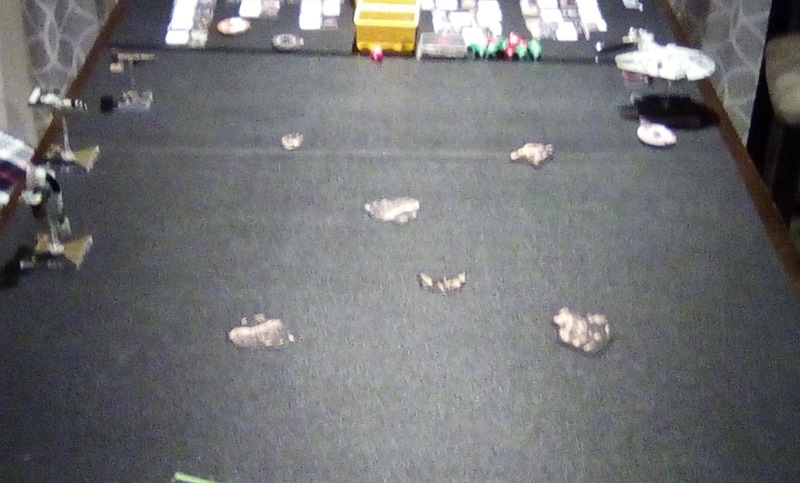 My opponent was flying a Scum and Villainy list of Graz the Hunter, Victor Hel, and Dalen Oberos. I was flying Kyle Katarn and two Rouge Squadron E-Wings. He won the iniative roll and elected to be second player (there is only one situation where you might want to be first player and that is if both players have low pilot skill lists and their plan relies on bumping the other person, but more on that later). Here is what the deployment looked like. We were both spread from the centre to the opposite corner, a flexible position that allowed us both to consolidate quickly if required. 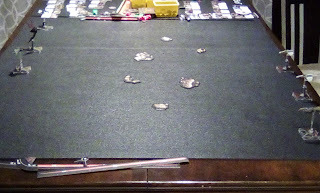 I always start on the back edge and fly slowly for a turn or two so Kyle has time to accumulate tokens. 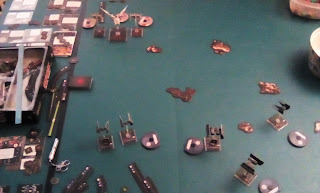 That said my initial plan was to quickly joust the center ship and hopefully get a temporary situation where my three ships could take out one of his without having all of his ships in range of one of mine (the initial plan changed to this after set up for no good reason...). With E-Wings this is not impossible. 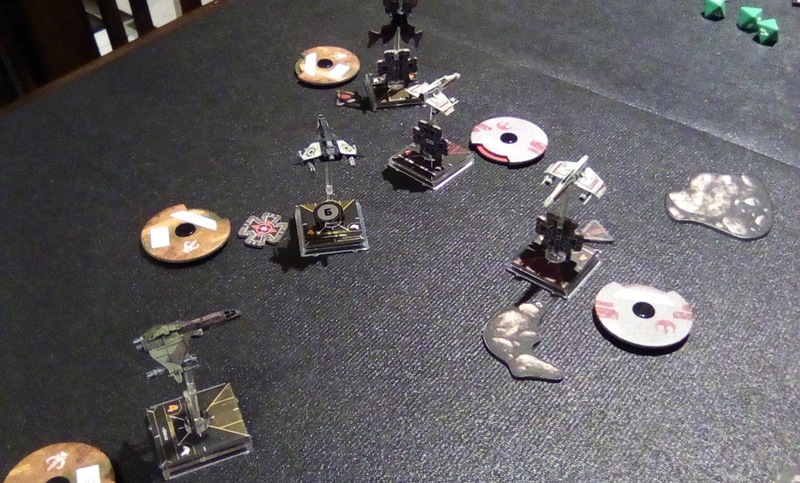 but actually quite tricky as both players need to move 4 or 5 straight and boost for shooting in the first turn. The only time it will work out in your favour is if on your opponent's first move they do not fly their ships into a tighter formation. 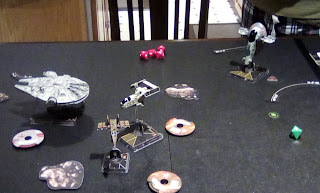 And even then on your second turn you have stressed E-Wings which have sadly predictable blue moves. At any rate, since that now almost every ship has some sort of boost or barrel roll they can all arc dodge a little. 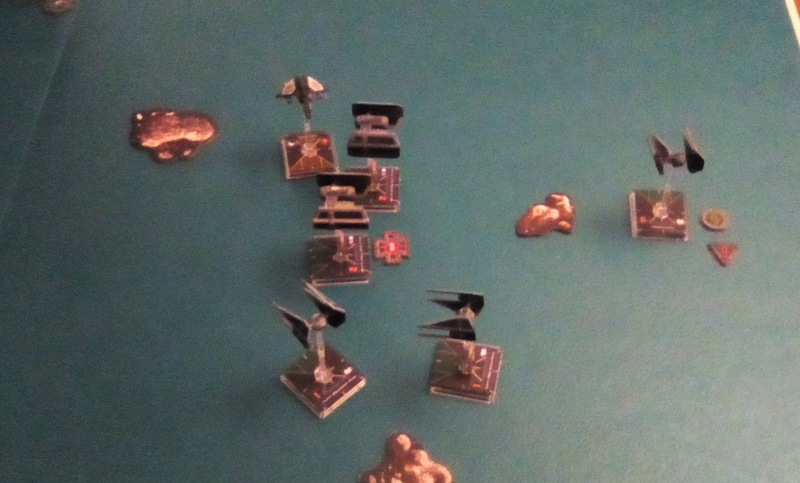 And that combined with all my ships moving before his he could always dodge one arc, even with a not so nimble Kirax, never mind the Star Viper. As the game unfolded Kyle was the first to go which left me in the situation described initially. Good thing the E-wings have collision detector! At this point the poor E-Wings that rely on getting second actions from support ships were destroyed or smashed down to half life by the end of the hour with only one ship and a bit being destroyed in return. During the whole game I felt like I was on the back foot. And quite literally was since my ships were always moving first. One change I made to the list after the game was swap R3 for R4 this gave me better blue moves, a white hard 1, and a squad cost of 198 instead of 200 for an inititive bid at the cost of looseing the ability to do a second lock. The result of initiate roll does not require a difficult decision to be made, because of the simultaneous fire rule the correct answer is to be the second player unless your squad is built for bumping and your opponent is of equal pilot skill. Which in my experience is an unusual situation. 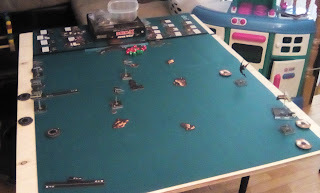 This means the iniative roll is the single most important dice roll in any game (if both players have any ships of equal pilot skill, which is more likely in 2nd ed). 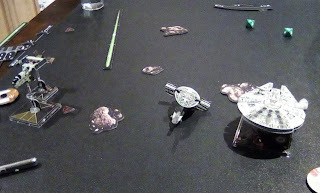 Let me explain why, other than the design team saying they were going to put more emphasis on manoeuvre in 2nd ed. Lots of ships have re-positioning or can take an upgrade that allows them to alter their final position after every ship with a lower pilot skill has moved. Many special abilities have been linked to arcs (specifically bullseye arcs, try lining up a bullseye arc if you move first :). 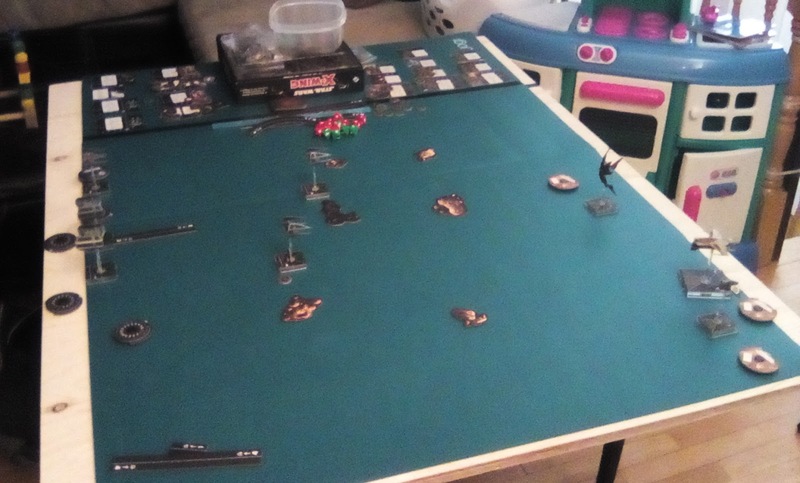 There are more ships in an average game (Approximatly 2-3 per squadron in 1st ed to 3-4 in 2nd ed) I can't back this up with stats but since generics seem to be more viable and the cost of many ships has gone down a bit I think it is correct. Finally there are half as many pilot skills so the chance of over lap is greater. The game has tried to mitigate the power of post manoeuvre re-positioning by giving barrel roll only six distinct positions that covers half the area it used to.... but was it enough? Take a pilot skill 6 ships if possible and be aware that most pilot skill 7 tricks are for engagement only (by this time you are already out of arc). Also, there are only 2 or 3 pilot skill 6 pilots in each faction and no more veteran instincts. Initiative bids are most important for lists with an average pilot skill of 4 and 5, I have not mathed it out but if feels like they bell curved pilot skill, also the best generics are at 4. The result is that you will likely fly against a pilot skill 4 or 5 list (local metas aside). Having at least one ship that goes last will make your opponent think twice about using a repositioning action as it may turn out to be an ineffective action. 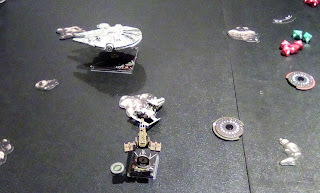 If you are a rebel player then look at how you can use Fenn Rau in the shuttle to give you some pilot skill 6 actions. Last night I was once again at my weekly games night. 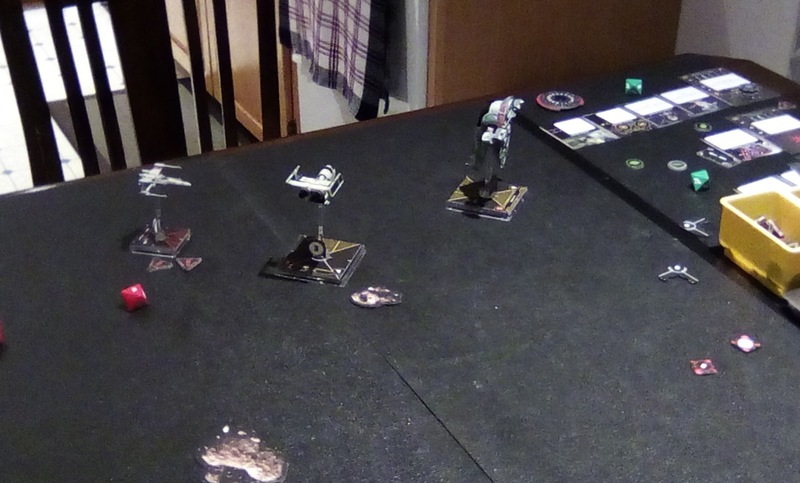 My first game was against another friend flying Captain Oicunn (PS 3), Whisper (PS 5) and an Imdaar Test Pilot (PS 3), and because I am a sucker for a good story line I flew my rebels against it. 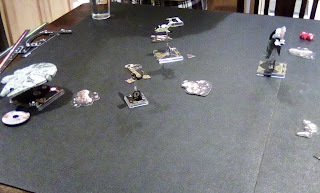 In the second game I flew Soontir's Flying Circus but more on that later. 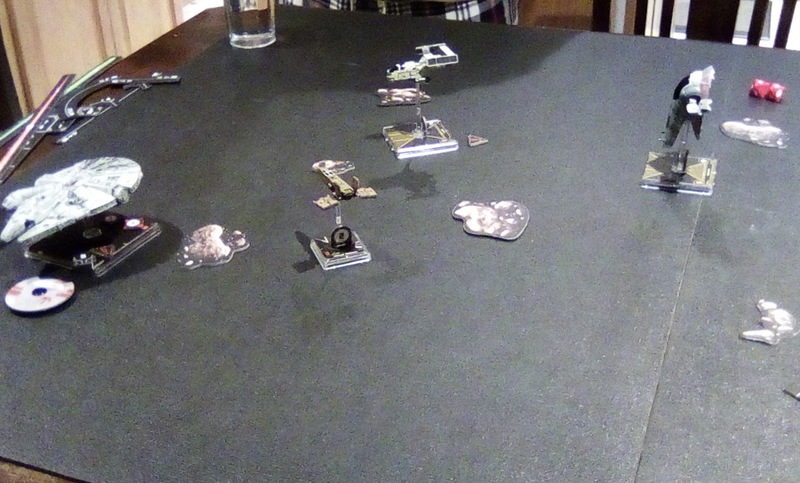 Anyway, this was the first time my friend had flown a decimator or phantom and he set up his ships too far away form each other. So, I isolated and killed his test pilot early, the decimator popped a little while after and then time was called. 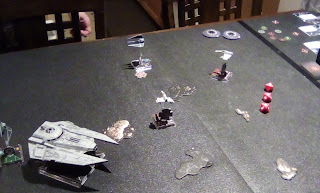 Long story short, the R4 was gold (or should I say blue...) but I feel like I developed a reasonable first order strategy for mid-PS Xwing squadrons. 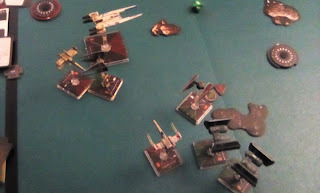 Attack the ships you outrank in pilot skill and avoid the ships that outrank you, after that you just need to run out the clock and call it a day. At NJCon15 last year, I found a quiet corner outside the main convention hall where a number of people were playing a skirmish game called "Saga". I'd heard of it, and have always wanted to get into dark ages but never got into it.. Until now. The guy in charge was very nice and we played a 4 point demo game. Then I started watching the History Channel show "Vikings", as well as the BBC show "The Last Kingdom", which is a bit better since its based on the Bernard Cromwell Books. Started reading those too.. Excellent subway reading. Saga itself is actually quite easy. You roll dice, and place these dice on a "battle board" which allows you to activate units and buff your guys, or debuff your opponents. There's "Fatigue" in which your guys get tired, and your opponent gets to "spend" this fatigue to do more things (or prevent your guys from doing things). An ingenious system. 4 points means you have 4 units, and the size of the unit depends on what it is. There are only 3 types of units in the game, Hirthguard (elites), Warriors (normal), and Levies (crap), and 1 point will buy one of these units. 1 point will buy 4 Hirthguard, 8 warriors, or 12 levies, so it evens out. Each faction has it own special weapon that you can give to a unit. The vikings for example get to have one of their elite units be "berserkers", so they get more attack dice, but less defense. You can also get mounted troops, Dane Axes, slings, and a few other things. The main meat of a faction is in the battle boards which are unique to the faction, and give each of them their flavor. You also get a warlord for free, and if he dies, game over. Ok, enough rules review (there are plenty online anyway). I just finished painting up all the hirthguard for both my vikings, and their anglo saxon opponents. Technically Anglo Saxons and Anglo Danes by this point looked pretty much the same (everybody's got a huge colorful shield and was hairy), so they could port to that too, which is a nice 2 for 1. The Vikings meanwhile can pass as Jomsvikings so again a good 2 for 1 faction. Anyway, here are the figs. 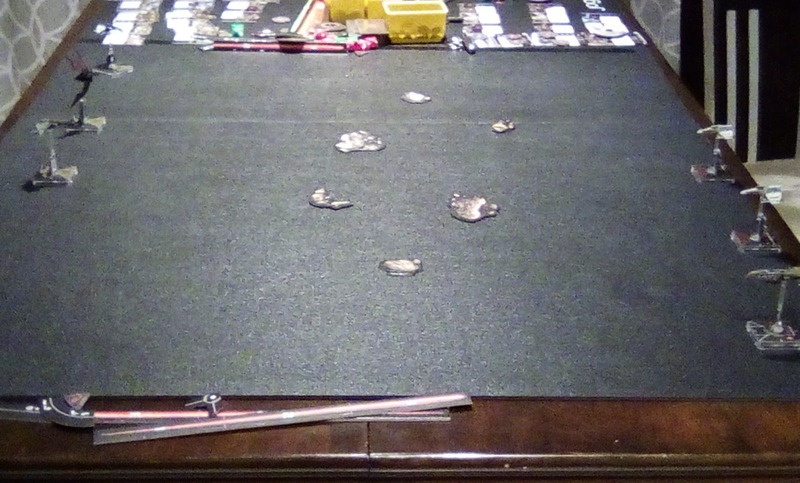 I used Little Big Men Studios (http://www.littlebigmenstudios.com/catalog/) transfers for the shields since they look fantastic, and I didn't want to have to paint them myself, memories of WFB Savage Orcs and Bretonians from my past come to mind. To differentiate them, the Saxons have no iron rim on their shields, and the Vikings will all have a rim. I figured its a good subtle difference that will show. I *might* put a red dot on the Vikings' bases. We'll see.